In the following article, we will take a look at the comparisons between Sony Alpha A6500 vs A7II. These are mirrorless offerings from Sony that are suitable for dedicated hobbyists. However, there are several differences between these two models that you have to consider before you make a choice. Sony Alpha A6500 is the newer release, and it comes with a number of great features such as the higher burst speed and the ability to record 4K videos. On the other hand, Sony Alpha A7II offers a full-frame sensor and great customization options. If you very much prefer a compact and lightweight camera, Sony Alpha A6500 makes a very good choice. Just like the predecessors, it comes with a slim housing, which measures 120 mm x 67 mm x 53 mm. The weight is only 453 grams. One nice thing regarding the design is the large grip area which feels solid and comfortable to hold. It has a soft eyecup, a big shutter button, and two custom buttons on the top plate. On the other hand, Sony Alpha A7II is slightly bigger and heavier. It measures 127 mm x 96 mm x 60 mm, with a weight of barely 600 grams. If you are fine with the bulkiness, though, this camera is very solid to hold. It has great customization options that are easy to reach. The features here that are not available on Sony Alpha A6500 include the exposure compensation wheel, an additional wheel which is very handy for direct dials to the ISO, aperture, and shutter speed, and an additional custom button. Each of the two models features a three-inch tilting display screen. Sony Alpha A6500 has a touchscreen, which is very convenient for selecting the focus points directly. The resolution is 922k dots. In addition, it has an electronic viewfinder with 2359k dots resolution and a 0.70x magnification. Sony Alpha A7II’s display is not a touchscreen. The resolution is higher at 1,230k dots. The viewfinder is also better, as it has a slightly higher magnification of 0.71x. 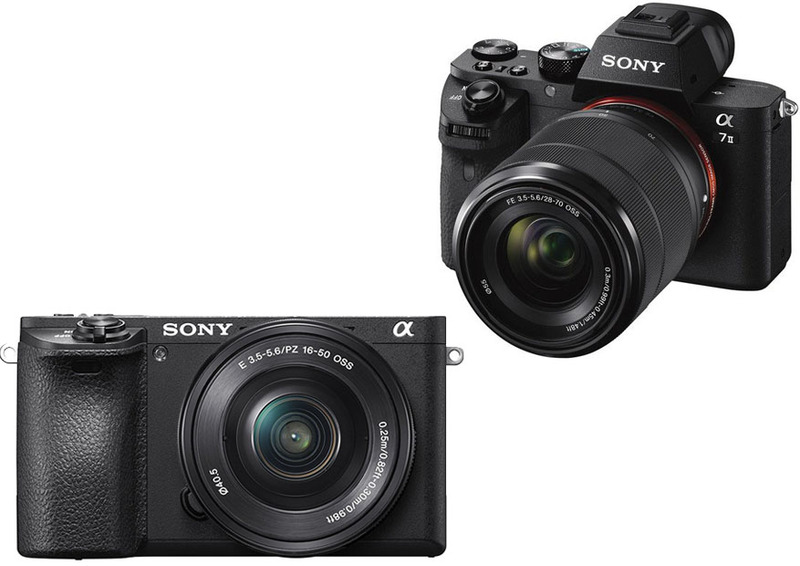 Take a look at our previous post about the sibling, Sony Alpha A6300 vs A7II. Sony Alpha A6500 is quite a feature-packed camera. It has a built-in flash, 4K video recording, and 11 fps continuous shooting. The AF system is very nice with 425 focus points and on-sensor phase detection. The ISO range goes from 100 – 25,600, and is expandable to 51,200. The maximum shutter speed is 1/4000s. Unfortunately, Sony Alpha A7II does not have a built-in flash and 4K video recording. But it can record Full HD videos. The ISO range is 100 – 25,600, and the maximum shutter speed is 1/8000s. The AF system is already quite capable with 117 focus points. Finally, you have to consider that Sony Alpha A6500 vs A7II use different sensors. Sony Alpha A6500 uses a 24MP APS-C sensor, whereas Sony Alpha A7II uses a 24MP full-frame sensor. The A7II has a better crop factor. The larger sensor also allows better ISO performance and color depth. So, generally, the image quality of the A7II is better. If you want to have a good full-frame camera, Sony Alpha A7II should be your choice. It has a full-frame sensor, which offers a better crop factor as well as better ISO performance and color quality. However, if you are fine with an APS-C sensor, Sony Alpha A6500 can be your choice; this model comes with more and newer features.